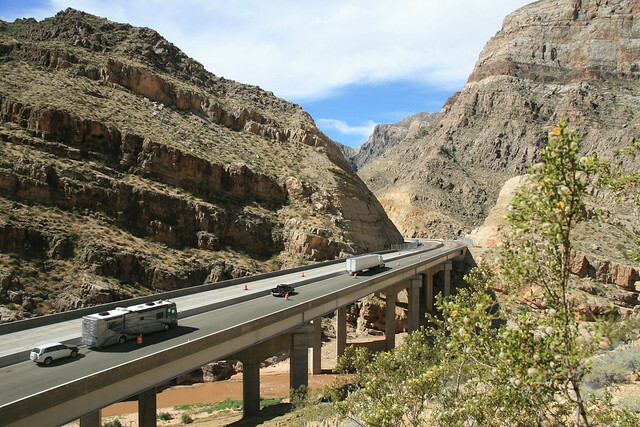 In a little more than a month you’ll be able to drive along the new bridge on Interstate 15 through the scenic Virgin River Gorge in northwest Arizona. We thought you might want to see what you’ll be driving on. This time-lapse video was shot as crews worked in difficult conditions from November through late February to build a southbound span at Virgin River Bridge No. 6. You can see traffic passing in both directions on the northbound span, which was completed last year. Meanwhile, the slideshow below offers stunning images of this project. Here’s what it takes: Dozens of steel girders, moved into place by huge cranes. Layer after layer of base to support the roadway. Pouring the bridge deck. Adding the surface and the striping. And something you don’t see: Arizona Department of Public Safety troopers keeping drivers safe on the temporarily divided northbound lanes. Two years of work is just about to come to an end. For most drivers, the bridge may look like just a simple structure. Watching the video, you can see that building a bridge, especially in an environment like the Virgin River Gorge, is anything but.